Even though the job description falls under the broad category of HVAC, the AC Technicians are concreted more in one area – Air Conditioning. AC Technicians are involved in repairing, installing and maintaining air conditioners in both residential and commercial settings. 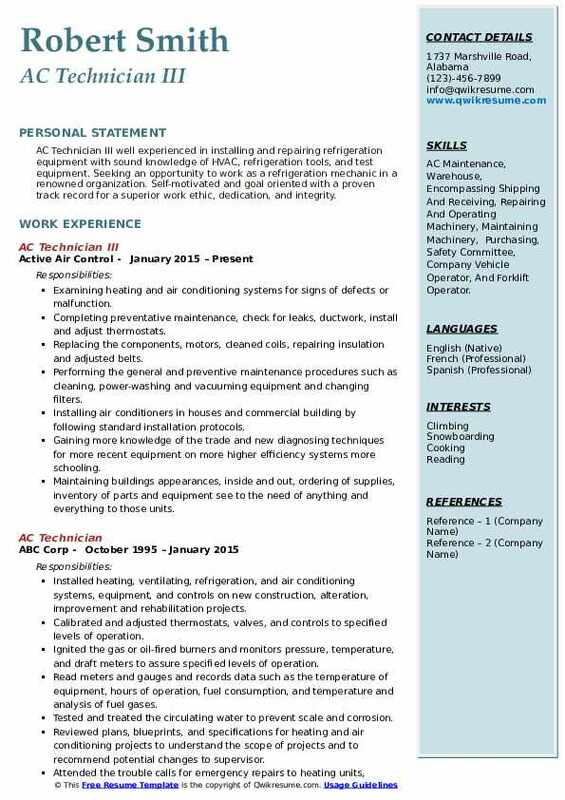 The AC Technician Resume lists core tasks such as – responding immediately to calls for repairs on Ac’s; asking customers and determining the exact problems, installing AC’s at both homes and offices, testing installed air conditioner functionalities and working, performing regular maintenance tasks, replacing old parts and educating customers on how to use Ac’s efficiently. Required skills and abilities to work as an AC Technician include – physical agility, problem-solving skills, strong customer-service orientation, a thorough knowledge of varying mechanical layout, electrical work knowledge and knowledge of handling complex AC systems. It is imperative for candidates to have a diploma in Electrical Engineering, and also hold relevant certification and licensure that may be required for this role. 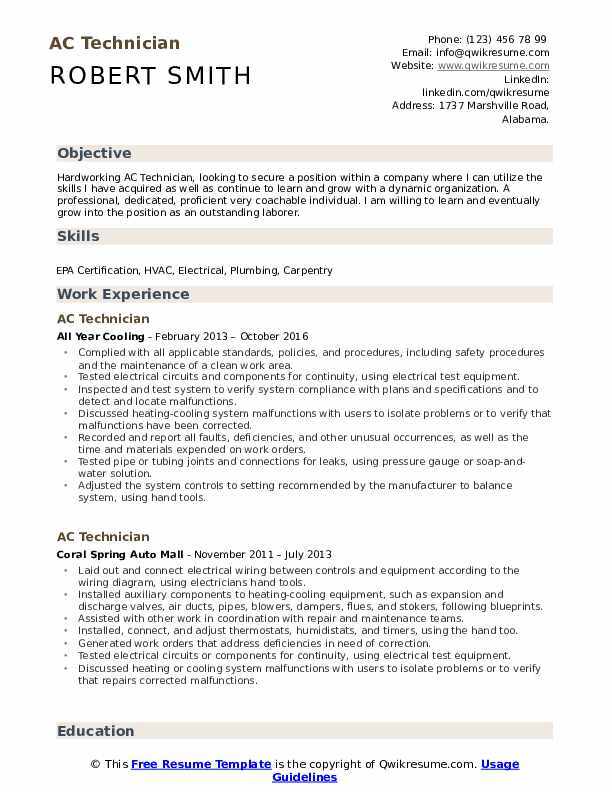 Headline : Hardworking AC Technician, looking to secure a position within a company where I can utilize the skills I have acquired as well as continue to learn and grow with a dynamic organization. A professional, dedicated, proficient very coachable individual. I am willing to learn and eventually grow into the position as an outstanding laborer. Complied with all applicable standards, policies, and procedures, including safety procedures and the maintenance of a clean work area. Tested electrical circuits and components for continuity, using electrical test equipment. Inspected and test system to verify system compliance with plans and specifications and to detect and locate malfunctions. Discussed heating-cooling system malfunctions with users to isolate problems or to verify that malfunctions have been corrected. Recorded and report all faults, deficiencies, and other unusual occurrences, as well as the time and materials expended on work orders. Tested pipe or tubing joints and connections for leaks, using pressure gauge or soap-and-water solution. Adjusted the system controls to setting recommended by the manufacturer to balance system, using hand tools. Recommended, developed, and performed preventive and general maintenance procedures such as cleaning, power-washing and vacuuming equipment, oiling parts, and changing filters. 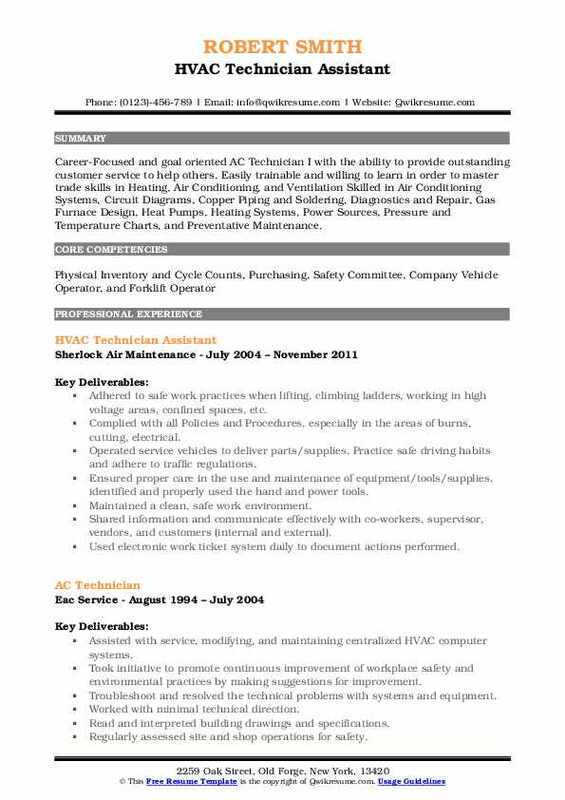 Objective : AC Technician with 4 years of experience. To secure a position in the construction industry where I can bring my skills and knowledge of the A/C field, and my willingness to learn new aspects of all phases of construction and become a valuable asset to that company. Fast learner eager to gain experience to become an asset and better the company. Experienced in fixing, improving, and overhauling all types of air conditioning. Well-versed in installing and repairing pumps, motors, fan coils and piping on air. Dealt with refrigerant pressure to determine to add or reduce or find the leak. Installed, serviced, and maintained air conditioning system for residential. Educated clients on taking care of the system and when to call technicians back. Install, maintain and repair heating, ventilation and air conditioning systems. Professionally trained in handling harmful refrigerants, ability to read blueprints and design specifications. Work with mechanical equipment such as compressors, thermostats, conductors, and fans. Responsible for installing, repairing and servicing air conditioning equipment for commercial and residential. Summary : Senior AC Technician well experienced in installing and repairing refrigeration equipment with sound knowledge of HVAC, refrigeration tools, and test equipment. To secure an AC Technician position with a successful, well-established organization that will enable me to grow professionally while contributing to the company's goals and objectives. Analyzed and developed job repair plans to complete the repair process on time. Used the electronic system guides and established a successful repair process. Repaired official ACs, water source heat pumps, and refrigeration and maintain its quality. Performed repairs at customers location and commensurately followed by the company guidelines. Operated a centralized, multiple zone systems. Checked temperature sensing points in buildings, adjusted controls. Reset temperature controls and steam spray valves for humidity controls. Logged the gauge readings, test water in cooling towers, record results of water condition tests, performed operator maintenance, and replaced minor parts. Ensured that unusual equipment configuration requirements operate efficiently to service exceptionally large buildings. Summary : Highly skilled, self-motivated Sr. AC Technician with extensive hands-on experience in all areas of construction, seeks long-term growth opportunity utilizing specialized training in HVAC, HVACR or DDC. Fast learner eager to gain experience to become an asset and better the company. Performing PM checks of package units, split systems, air handlers and exhaust fans. Identifying the service work to be done, purchasing parts and completing work. Replacing the components, circuit boards, and motors, cleaning coils, repairing the insulation adjusted belts. Company liaison with customer explaining service work to be done and getting authorization. Maintain tools, supplies equipment to maintain constant safe operable conditions. Assisting with generators installment in diagnosing repair equipment for operating. Doing split unit and hanging air handler in rooms, piping up the pipes to the condensers outside. Doing wiring in the condenser to disconnect box or existing box. Mounting pipe covers, taping a pipe with 143 wire, making holes through drywalls for the pipe and also for the main power. Evacuating the condenser with the manifold gauge and also adding freon r-22 or 143a to the condenser and also new homes roughin pipes. 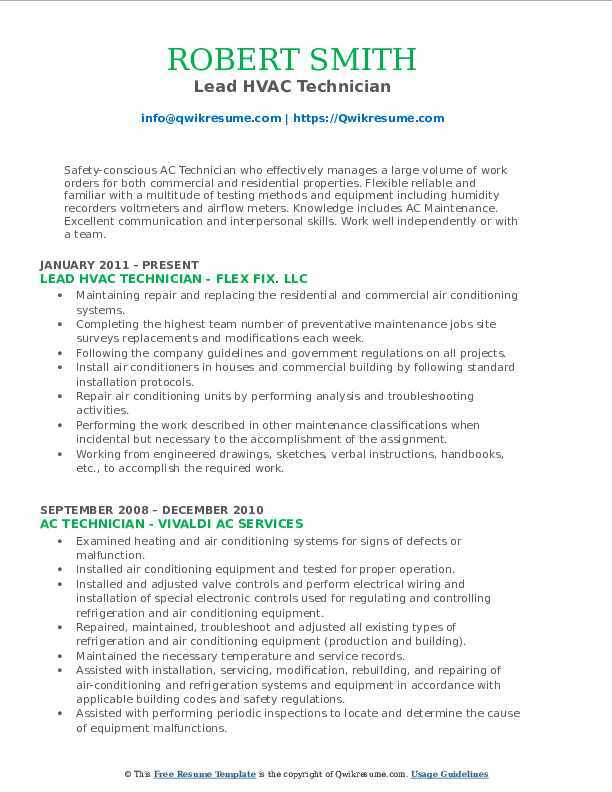 Summary : AC Technician III well experienced in installing and repairing refrigeration equipment with sound knowledge of HVAC, refrigeration tools, and test equipment. 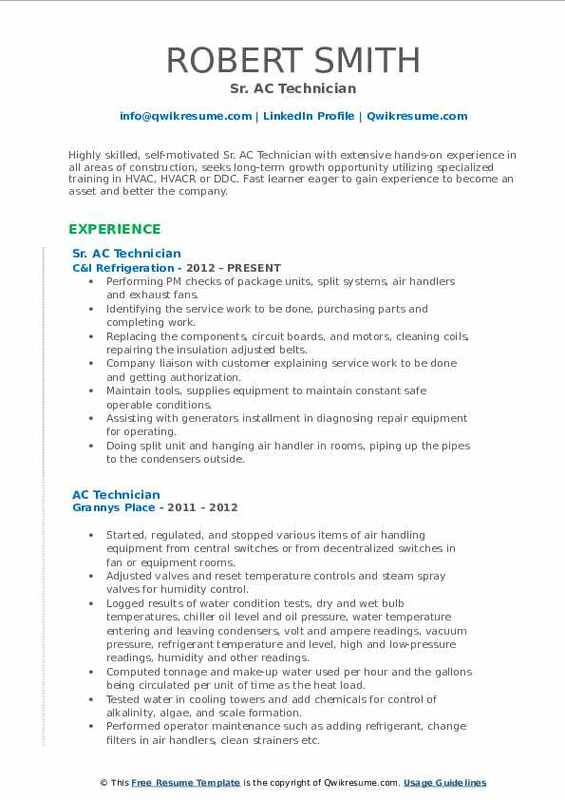 Seeking an opportunity to work as a refrigeration mechanic in a renowned organization. Self-motivated and goal oriented with a proven track record for a superior work ethic, dedication, and integrity. 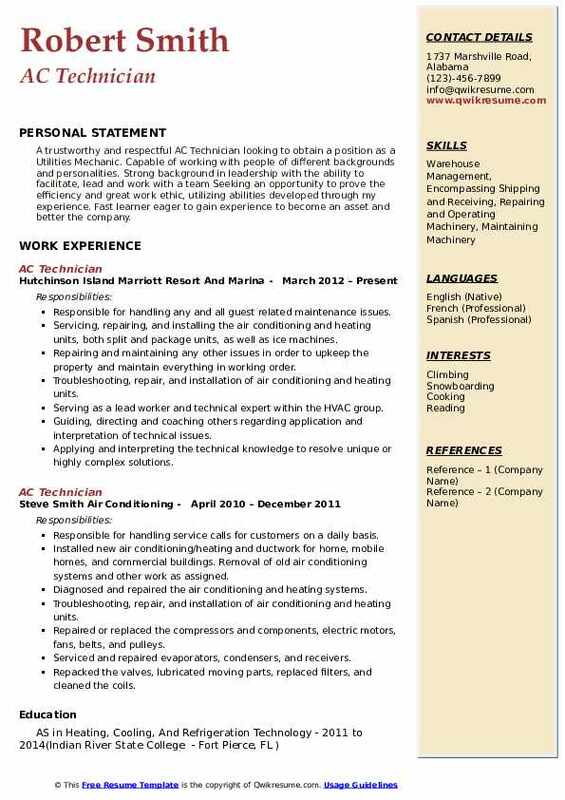 Skills : AC Maintenance, Warehouse, Encompassing Shipping And Receiving, Repairing And Operating Machinery, Maintaining Machinery, Purchasing, Safety Committee, Company Vehicle Operator, And Forklift Operator. Examining heating and air conditioning systems for signs of defects or malfunction. Completing preventative maintenance, check for leaks, ductwork, install and adjust thermostats. Replacing the components, motors, cleaned coils, repairing insulation and adjusted belts. Performing the general and preventive maintenance procedures such as cleaning, power-washing and vacuuming equipment and changing filters. Installing air conditioners in houses and commercial building by following standard installation protocols. Gaining more knowledge of the trade and new diagnosing techniques for more recent equipment on more higher efficiency systems more schooling. Maintaining buildings appearances, inside and out, ordering of supplies, inventory of parts and equipment see to the need of anything and everything to those units. 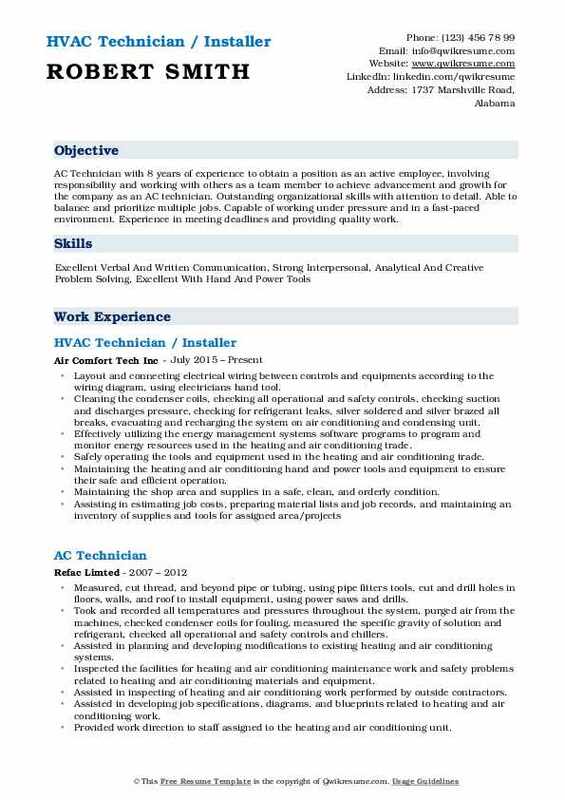 Summary : AC Technician with 8 years of experience to obtain a position as an active employee, involving responsibility and working with others as a team member to achieve advancement and growth for the company as an AC technician. Outstanding organizational skills with attention to detail. Able to balance and prioritize multiple jobs. Capable of working under pressure and in a fast-paced environment. Experience in meeting deadlines and providing quality work. Layout and connecting electrical wiring between controls and equipments according to the wiring diagram, using electricians hand tool. Cleaning the condenser coils, checking all operational and safety controls, checking suction and discharges pressure, checking for refrigerant leaks, silver soldered and silver brazed all breaks, evacuating and recharging the system on air conditioning and condensing unit. Effectively utilizing the energy management systems software programs to program and monitor energy resources used in the heating and air conditioning trade. Safely operating the tools and equipment used in the heating and air conditioning trade. Maintaining the heating and air conditioning hand and power tools and equipment to ensure their safe and efficient operation. Maintaining the shop area and supplies in a safe, clean, and orderly condition. Summary : Safety-conscious AC Technician who effectively manages a large volume of work orders for both commercial and residential properties. Flexible reliable and familiar with a multitude of testing methods and equipment including humidity recorders voltmeters and airflow meters. Knowledge includes AC Maintenance. Excellent communication and interpersonal skills. Work well independently or with a team. Maintaining repair and replacing the residential and commercial air conditioning systems. Completing the highest team number of preventative maintenance jobs site surveys replacements and modifications each week. Following the company guidelines and government regulations on all projects. Install air conditioners in houses and commercial building by following standard installation protocols. Repair air conditioning units by performing analysis and troubleshooting activities. Performing the work described in other maintenance classifications when incidental but necessary to the accomplishment of the assignment. Working from engineered drawings, sketches, verbal instructions, handbooks, etc., to accomplish the required work. Reading and interpreting facilities/mechanical drawings, wiring diagrams, and/or schematics. Summary : Career-Focused and goal oriented AC Technician I with the ability to provide outstanding customer service to help others. Easily trainable and willing to learn in order to master trade skills in Heating, Air Conditioning, and Ventilation Skilled in Air Conditioning Systems, Circuit Diagrams, Copper Piping and Soldering, Diagnostics and Repair, Gas Furnace Design, Heat Pumps, Heating Systems, Power Sources, Pressure and Temperature Charts, and Preventative Maintenance. Adhered to safe work practices when lifting, climbing ladders, working in high voltage areas, confined spaces, etc. Complied with all Policies and Procedures, especially in the areas of burns, cutting, electrical. Operated service vehicles to deliver parts/supplies. Practice safe driving habits and adhere to traffic regulations. Ensured proper care in the use and maintenance of equipment/tools/supplies, identified and properly used the hand and power tools. Maintained a clean, safe work environment. Shared information and communicate effectively with co-workers, supervisor, vendors, and customers (internal and external). Used electronic work ticket system daily to document actions performed. Completed timesheet and required written reports accurately and responded to email messages. Represented RTI in a professional manner in appearance and demeanor when performing job functions. Demonstrate and promote ethical behavior. 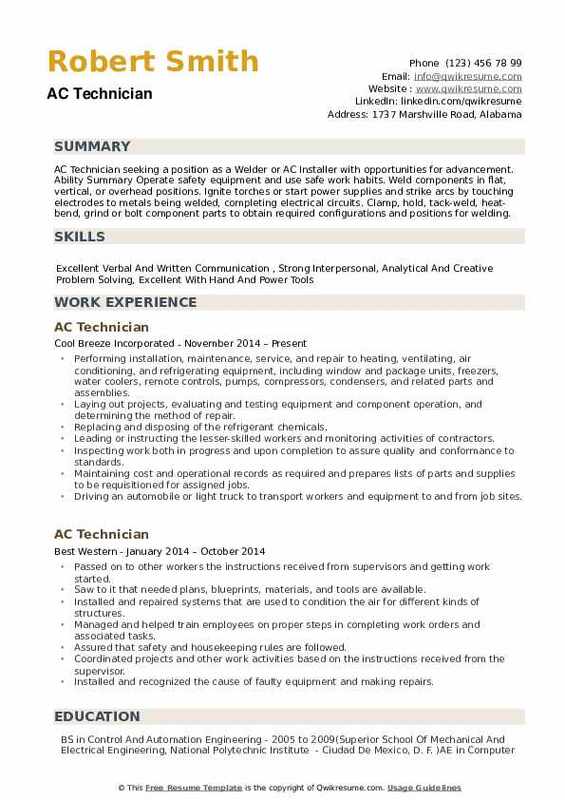 Summary : A trustworthy and respectful AC Technician looking to obtain a position as a Utilities Mechanic. Capable of working with people of different backgrounds and personalities. Strong background in leadership with the ability to facilitate, lead and work with a team Seeking an opportunity to prove the efficiency and great work ethic, utilizing abilities developed through my experience. Fast learner eager to gain experience to become an asset and better the company. Responsible for handling any and all guest related maintenance issues. Servicing, repairing, and installing the air conditioning and heating units, both split and package units, as well as ice machines. Repairing and maintaining any other issues in order to upkeep the property and maintain everything in working order. Troubleshooting, repair, and installation of air conditioning and heating units. 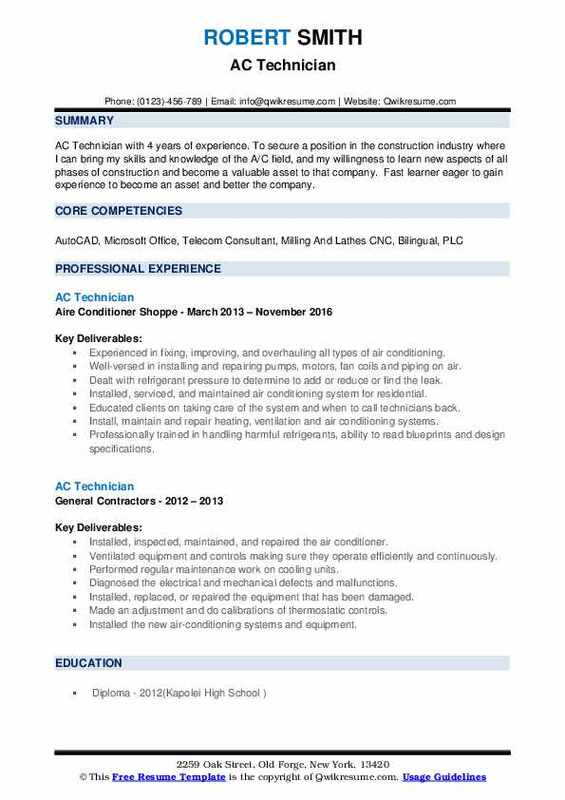 Serving as a lead worker and technical expert within the HVAC group. Guiding, directing and coaching others regarding application and interpretation of technical issues. Applying and interpreting the technical knowledge to resolve unique or highly complex solutions. Anticipating and proactively pursuing the facility related issues and/or problems. Directing and checking the work of other technicians. Promoting the compliance of all regulatory standards. Worked from blueprints, drawings, models, or verbal and written instructions. Repaired components within a system to include transformers, motors, electrodes, solenoids, rheostats, and aquastats. 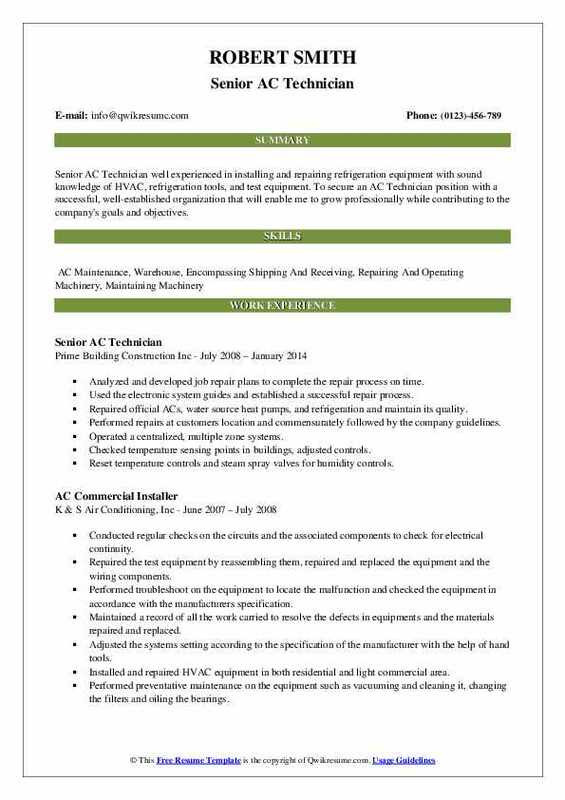 Objective : AC Technician seeking a position as a Welder or AC Installer with opportunities for advancement. Ability Summary Operate safety equipment and use safe work habits. Weld components in flat, vertical, or overhead positions. Ignite torches or start power supplies and strike arcs by touching electrodes to metals being welded, completing electrical circuits. Clamp, hold, tack-weld, heat-bend, grind or bolt component parts to obtain required configurations and positions for welding. Performing installation, maintenance, service, and repair to heating, ventilating, air conditioning, and refrigerating equipment, including window and package units, freezers, water coolers, remote controls, pumps, compressors, condensers, and related parts and assemblies. Laying out projects, evaluating and testing equipment and component operation, and determining the method of repair. Replacing and disposing of the refrigerant chemicals. Leading or instructing the lesser-skilled workers and monitoring activities of contractors. Inspecting work both in progress and upon completion to assure quality and conformance to standards. Maintaining cost and operational records as required and prepares lists of parts and supplies to be requisitioned for assigned jobs. Driving an automobile or light truck to transport workers and equipment to and from job sites.